Thank you for your interest in the Cremation Society of New Hampshire. This temporary website includes a selection of our most frequently requested information. If you don’t see your question answered below, please call us at 1-800-493-8001 or email us at info@csnh.com and we will be happy to help you. 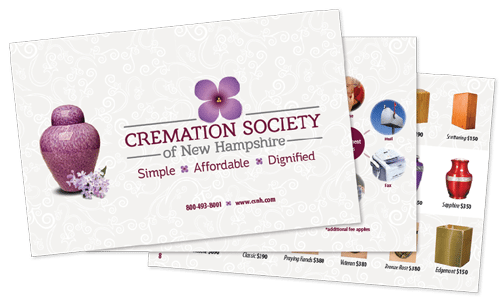 The Cremation Society of New Hampshire specializes in just one thing: simple cremation. Our purpose is to provide the public with an alternative to the complicated and costly funeral system which is common in America today. We carry out your wishes simply, very affordably and with dignity. High funeral and cemetery costs, changing family demographics and varying religious beliefs are just a few of the many reasons why most people choose to be cremated. Not only is cremation considered a more environmentally friendly option, it also allows for a wide range of personally meaningful options for the final disposition of our remains, such as cemetery interment, burial on private property, scattering at sea or kept at home. People are choosing the Cremation Society over local funeral homes for the reasons outlined above, as well as countless others. By providing affordable pricing, as well as an array of value-added services and safeguards, we help lessen the burden – both financial and emotional – that is placed upon surviving family members at a most difficult time. A registration form can be downloaded here and can be returned with your one-time $30 membership fee. This fee defrays the cost of maintaining your records and makes you eligible for our discounted member rate. Members are also entitled to pre-pay and have the option to set up customized payment plans. Our most popular packages are listed below. You may review our full brochure, which includes our General Price List, by clicking here. Our simplest offering and is designed for those who “just want to be cremated” without any service or ceremony. This basic package includes everything legally required for a direct cremation. This package does not include an urn. Provides a dignified tribute to those that proudly served our country and is offered at a discounted rate as our way of saying thank you on behalf of a grateful nation. A graveside gathering and service, with or without clergy present, is a simple yet meaningful way to honor the memory of a life well lived. Let our caring and professional staff make all the necessary cemetery arrangements so you or your family won’t have to. A memorial service or gathering following the cremation is one of the most popular ways to commemorate the life of those who have passed. Note: Packages do not include cash advance items such as newspaper charges to publish obituary notices, State fee to issue death certificates, cemetery costs, and clergy honorariums. To access and electronically sign the custody, cremation and final disposition authorization form, please click the button below.